Standing approximately 17 inches in height, the jug’s sheer size suggests that it was used for advertising purposes, and placed in a china merchant’s storefront window to attract the attention of prospective buyers. The jug’s plethora of transfer-prints also suggests that it may have sat inside a shop and been used to showcase a variety of images one could have printed on smaller ceramic wares. Of the 16 prints found on the jug (some of which are duplicates) several are Masonic in nature, and likely reflect the public’s fascination with the fraternal organization. Similar yellow-glazed earthenwares were produced in England during the latter years of the 18th century and the first several decades of the 19th century. 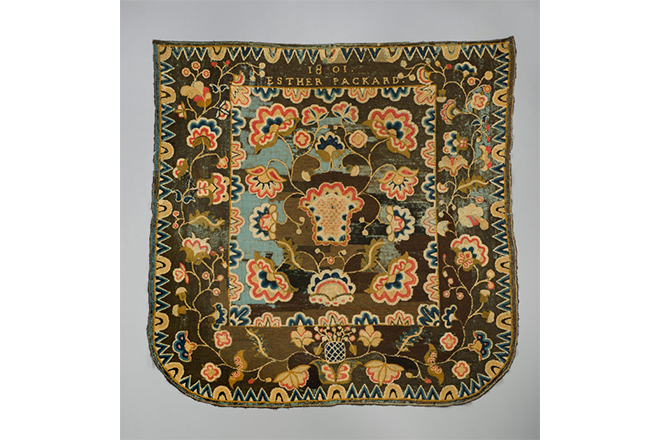 Pile-sewn rugs added warmth and decoration to beds in the 18th and early 19th centuries. This example was made by Esther Packard of Cummington, Massachusetts, when she was 68 years old. It relates to three known bed rugs in museum collections, one of which is also attributed to a member of the Packard family. Designs decorating many different types of bed coverings, including quilts, embroidered coverlets, and bed rugs, were borrowed, copied, and adapted over many years and succeeding generations. Zedekiah Belknap was born in Auburn, Massachusetts (near Worcester), but grew up in Weathersfield, Vermont, just south of Windsor. He graduated from Dartmouth College in 1807 with the hope of entering the ministry. Instead, Belknap spent his life painting prosperous farmers and shopkeepers along the Connecticut River Valley and in Massachusetts. The inscriptions on this fine example of Belknap’s work places the painter in Dummerston, Vermont, about 1832 when he portrayed Asa Knight and his wife, Susan, whose store is now at Old Sturbridge Village. The amazing coincidence for Deerfield is that the elder daughter, Susan (1820-1881), of Dummerston merchant, farmer, and magistrate John Foster Stearn was married in 1844 to George Sheldon (1818-1916) of Deerfield, nationally known antiquarian and the founder of the Pocumtuck Valley Memorial Association in 1870. Born in Middletown, Connecticut, Samuel Pierce probably apprenticed in the shop of local pewterer Joseph Danforth. After completing his training, Pierce moved his family to Greenfield, Massachusetts, in 1792 or early 1793, to pursue his trade as a whitesmith at the head of navigation on the Connecticut River. Although his pewter is uncommon today, Pierce produced a wide range of forms (basins, teapots, plates, dishes, porringers, rosettes for fan lights, and baptismal bowls) over the course of his career. In addition to examples of Pierce’s pewter, Historic Deerfield also owns his account books, tools, molds, and the only extant touchmark of an American pewterer. Inscribed "This may certify that ASA FIELD, has worked for the subscriber some time past, as an apprentice at the CABINET BUSINESS, and has acquitted himself as a faithful, trusty, upright and honest person. He is thought to be worthy of patronage and confidence, and is hereby recommended to the public as such. Wishing for success to all Mechanical operators, and especially to this useful Craft. ANTHONY VANDOORN. Brattleboro, Vt. 1846." Cabinetmaker Anthony Van Doorn moved to Brattleboro from Rhode Island in 1815 where he established a shop west of town. In 1830, he opened a larger shop on Whetstone Brook where it crosses Brattleboro's Main Street near the town's commercial center. There he incorporated steam and water power in his workshop, and operated the largest furniture making establishment in Vermont until 1851. Known examples of his furniture embody the late Federal and Empire styles, fashionable in the central Connecticut River Valley in the first half of the 19th century. This rare broadside, printed on silk, serves as a testimonial to his apprentice, Asa Field, who may have been striking out on his own, while providing the only known printed image of his factory, and examples of Van Doorn's products. General Towner signed and dated "J. Brown Pinxt/ Oct 10th 180-" on the reverse, Laura Towner signed and dated "Ja. Brown Pinx [month obscured] 25, 1807" along the top edge of the reverse. Williamstown residents General William Towner and his wife Lurana Chadwick Towner were painted in an expressive realistic style by itinerant artist James Brown. Towner was an eminent physician and surgeon, who also served as a Massachusetts state senator and representative. It was said of Towner that “he was a man of graceful exterior and pleasing manners, large and well-proportioned, a courtly gentleman of the olden time, fond of society and always deeply interested in education and politics.” Less is known about Lurana Towner, but her portrait and accessories speak to her refinement, education, and status in the community. The artist James Brown painted bust length, three quarter, and full length portraits of sitters ranging in location from Williamstown to Plymouth, Massachusetts. Chief characteristics of Brown’s work are the vigorous facial modeling and striking reddish brown coloration. 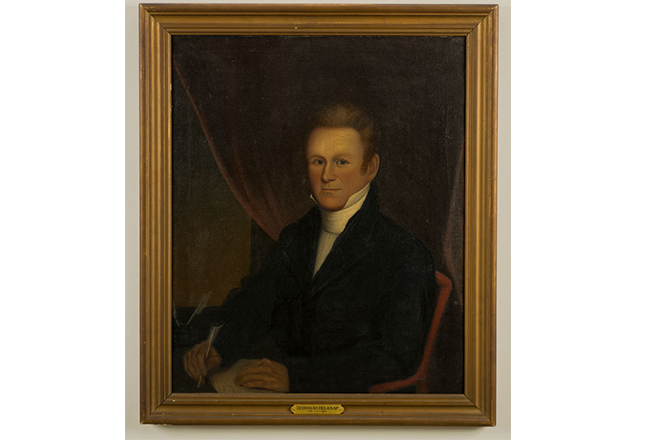 The Williamstown Art Conservation Center has conserved General Towner’s portrait; Mrs. Towner will undergo treatment this year. The process of transfer-printing on salt-glazed stoneware did not meet with the same success as printing on creamware. The pitted, salt glazed surface of the stoneware was not as effective as printing on creamware’s smooth, lead glazed surface. Most printing on stoneware appears to have been limited to plates, and in the majority of these examples, the print was created using a single color such as purple, red, or sepia. 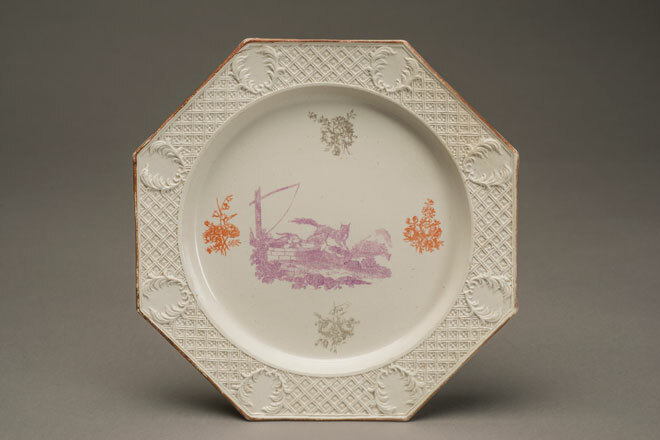 Stoneware plates printed in multiple colors—such as this example—are therefore exceedingly rare. Current research suggests that the designer of the Aesop’s Fable scene (The Fox and the Goat) located at the center of the plate was Jefferyes Hammett O’Neale, who painted similar fable scenes for the Chelsea porcelain factory. 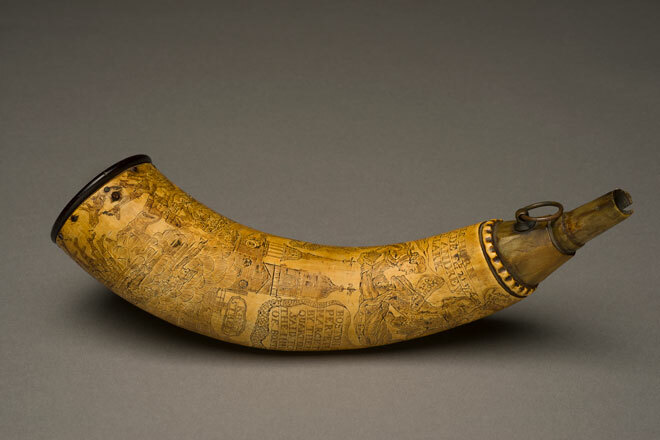 This powder horn, with exquisite and poignant engraving, is arguably the finest example to survive from the American Revolution. The engraver was a professional—Andrew Clark by name—who was a native of South China, Maine, who served as an artificer, or skilled mechanic, with General Henry Knox’s artillery. Three other horns by Clark are known. Unlike most powder horns, this example had two original owners, and one a woman, John and Sarah Gatchel, who were among the original settlers of Vassalboro, Maine. John served as a guide on the Kennebec River during Benedict Arnold’s ill-fated campaign to take Quebec City a few months before the horn was made. What makes the horn so compelling is that Clark executed the complex engraving on a spiraled and tapering 'canvas' depicting in detail two seminal political cartoons of the time: Paul Revere's Boston Massacre and The able Doctor, or America Swallowing the Bitter Draught (from the June 1774 issue of the Royal American Magazine).